Nothing is stronger than a mother's love surrounded by its Pure Spirits. This mare and her foal share a moment of affection in this wonderful image by the artist. Someday, this little one will leave its mother's side, but for now the foal feels the contentment of knowing it is protected and loved. Kimerlee Curyl is an award-winning photographer who is active in the preservation of the wild horses of the West. She is passionately dedicated to her work with Return to Freedom - The American Wild Horse Sanctuary whose goal is to save their place on this land. Says Curyl, "It's a magical place and I am proud to be a part of it." 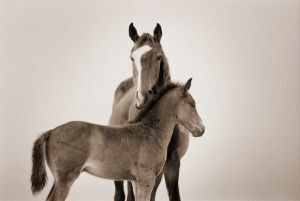 The artist has donated several images to various organizations to help preserve the wild horses.